For over 20 years, our technicians have served large and medium businesses all over the Metroplex and beyond. Now, we're bringing this high-quality service to individuals and small businesses. We'll work on any brand of computer, smartphone, printer, scanner, or other technology device. We offer networking, syncing, virus removal, web protection and more. And since you can get a technician to come to your home or office, drop your device off at our shop, or get remote help right from your desktop, you get the help you need on your schedule. Every technician is a trusted employee and we never hire subcontractors. Also, while we can help you with everything from choosing to setting up your solution (and even offer customized training), we don't sell products, so the expert advice we offer is based solely on your needs, never on what brings in the most profit for us. 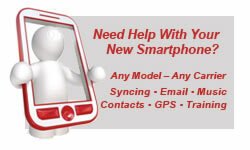 Setting up and synching the latest smartphone can be time-consuming and frustrating. Why not let the technology experts do it for you? We'll have you downloading apps and reading your email in no time.